Scientific Background: The thymidine analogue BrdU (5-Bromo-2-Deoxyuridine), a derivative of uridine, can substitute for thymidine during DNA synthesis. The detection of BrdU incorporation into DNA provides a common method to quantify newly synthesized DNA and identify cells in the S-phase of the cell cycle. The use of BrdU incorporation in proliferation assays facilitates the study of DNA repair, sister chromatid exchange, and the cytokinetics of normal and neoplastic cells. 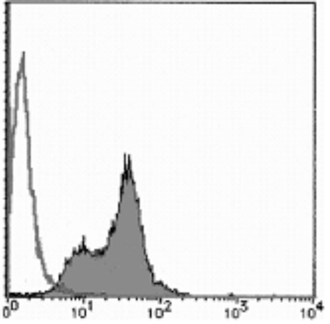 Flow cytometric analysis indicates the reaction of isotypic control (open histogram) and BrdU, mAb (2B1) (shaded histogram) to BrdU treated Raji cells. Immunohistochemistry analysis of paraffin-embedded section of mouse testis stained with BrdU, mAb (2B1) to detect cells which have incorporated BrdU.